Training Goal: Through the use of this team exercise, the participants will realize how easy it is to make an error of incorrect installation and/or omission. They will then develop ways to lessen the chance of making these errors. For further information on how to use this model please view our PowerPoint Presentation below. You may order this kit for $45 using the order form below. Included with this kit is a complete PowerPoint Presentation illustrating via pictures the total ways the job can be done incorrectly (over 1 billion ways). 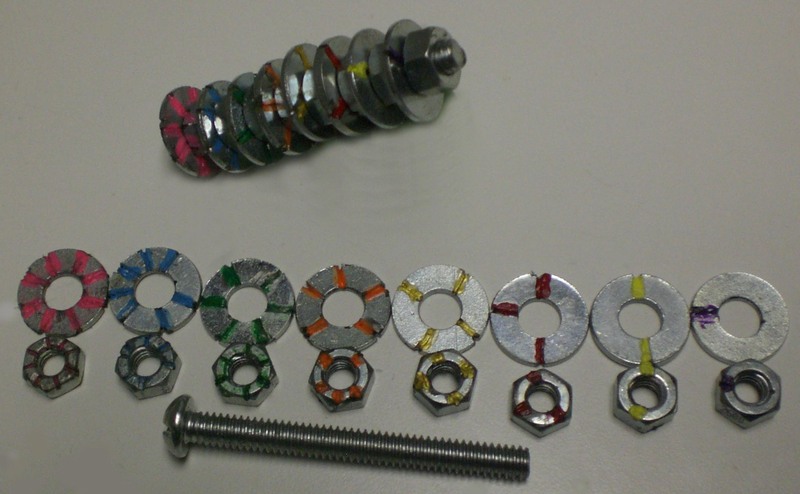 Should you wish to build your own Model, obtain a bolt, 8 nuts, 8 washers and cut # groves into each and color the (a different color for each) nut & washer as illustrated above. A model takes approx. 2-3 hours to fabricate.